The Utah Eviction Process can often feel like a maze of unclear rules and legal jargon. At the Law Offices the Kirk A. Cullimore, our focus is on educating our clients to avoid common mistakes and pitfalls. The page below is a basic introduction to the Utah Eviction Process. Questions about evicting your Utah tenant? Contact Us Today to learn more about our landlord services. When a tenant violates the terms of a lease agreement, courts require that the tenant be served with a notice stating the how the lease was violated. The most common lease violations committed by tenants include failing to pay rent or other fees, causing a nuisance (disrupting other residents, keeping unauthorized pets, damaging the property, etc. ), criminal activity, or failing to vacate after the lease term ends. Most lease violations will require the landlord to allow the tenant three days to cure the violation. However, if the violation is particularly severe, an option to cure may not be required. Our office provides these various notice forms at no cost. To download, please visit our FORMS page. If you have any question as to which notice is appropriate in a given situation, we strongly recommend you contact one of our attorneys at 801.571.6611. If the tenant is able to fully cure the violation within the period provided by the notice, the lease will continue and remain in effect. If the tenant fails to fully comply with the notice in the specified period of time, the tenant is then considered an “unlawful detainer.” A landlord may then file a lawsuit to restore possession of the premises and seek judgment for damages. If the tenant chooses to vacate the property rather than comply with the notice, the tenant may still be held responsible for any outstanding balances owed, damages to the property, and lost future rents. The landlord, however, has the responsibility the mitigate lost future rents by re-renting the unit as quickly as reasonably possible. If violations of the lease agreement occur again at a later date, a landlord will need to start the eviction process over by re-serving a notice. Repeated violations, however, may result in an escalation of the case. Please contact our office at 801.571.6611 to discuss repeated violations. A Summons and Complaint will be prepared by our office, filed with the court, and served upon the tenant. Once served with the complaint, the tenant has three days to file an answer with the court. Once the tenant has vacated and total amounts due can be verified, those amounts can be sought through additional court motions or through collection efforts. Collections can often be difficult, but the Law Offices of Kirk A. Cullimore has a stellar success rate in collecting on our eviction cases. If the tenant files an answer to the complaint within three days, either party may request an Immediate Occupancy Hearing. The hearing will typically be scheduled within 10 days of receiving the tenant’s answer. The purpose of the Immediate Occupancy Hearing is to solely determine who has the right to possess the property. Issues of amounts due will not be addressed by the court at this time. However, our attorneys will typically utilize this hearing as an opportunity to resolve the entire matter with the tenant through a settlement agreement. If the tenant fails to appear at this hearing, the court will typically grant default judgment for the landlord. If the court rules that the tenant did violate the lease and did not properly comply with the notice, an Order of Restitution will be signed. This order restores possession of the premises to the landlord after a certain period, typically three days, during which the tenant may remove his or her belongings from the property. If the tenant fails to appear at the Immediate Occupancy Hearing, the court will often restore possession to the landlord immediately. If the tenant does not vacate the property by the time specified in the Order of Restitution, the landlord then has the right to have a constable or sheriff remove the tenant from the premises. Locks may be changed and the tenant will have to arrange with the landlord to remove any remaining personal belongings. If the court determines that either the tenant did not violate the lease, the notice was improper, or that the tenant complied with the notice, then the tenant may be allowed to remain in the property. If the court allows the tenant to remain in the property after the Immediate Occupancy Hearing, the case must be analyzed to determine possible resolutions, which may include starting over with posting a new notice. Our office thoroughly reviews all cases before being filed to ensure that common pitfalls are avoided. If the tenant does not properly respond with an answer to the landlord’s complaint, the landlord may then file for default judgment. If the tenant fails to file an answer to the complaint, default judgment will typically be entered in favor of the landlord. The judgment grants the landlord the right to collect from the tenant damages specified in the order. The Order of Restitution, once served upon the tenant, restores possession of the premises to the landlord after a specified period of time, usually 72 hours. If the tenant does not vacate the property by the time specified in the Order of Restitution, the landlord then has the right to have a constable or sheriff remove the tenant from the premises. Locks may then be changed and the tenant will have to arrange with the landlord to remove any remaining personal belongings. After possession of the premises has been restored to the landlord, additional motions or proceedings may be necessary to collect amounts owed by the tenant. The Law Offices of Kirk A. Cullimore advises our clients of all available options and will recommend a strategy most likely to lead to successful collection of damages. For more information, please contact our office at 801.571.6611 or litigation@cullimore.net. The Utah Eviction Process can often feel like a maze of unclear rules and legal jargon. At the Law Offices the Kirk A. Cullimore, our focus in on educating our clients to avoid common mistakes and pitfalls. 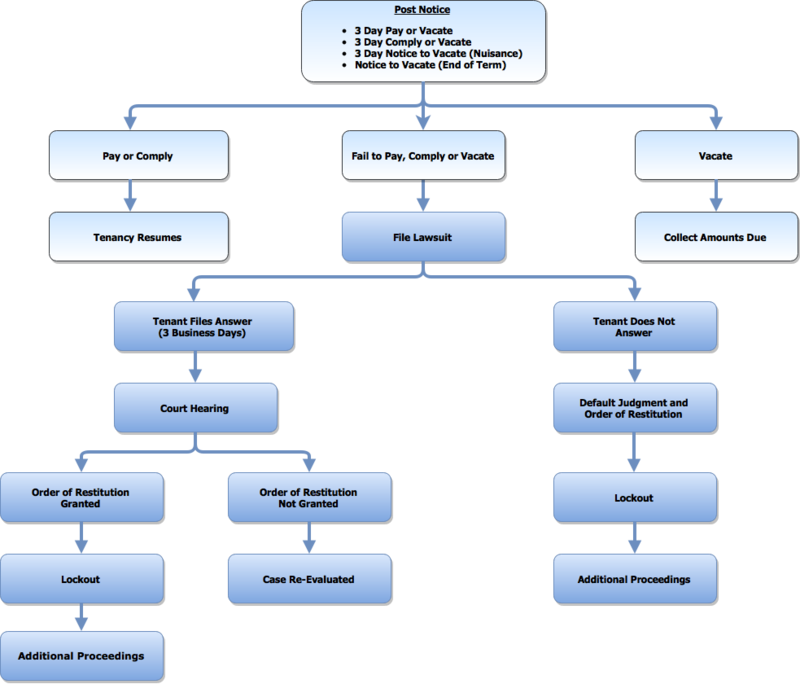 The flowchart below is a basic introduction to the Utah Eviction Process. Hover over the question marks to learn more about each step. When a tenant violates the terms of a lease agreement, courts require that the tenant be served with a notice stating the how the lease was violated. The most common lease violations committed by tenants include failing to pay rent or other fees, causing a nuisance (disrupting other residents, keeping unauthorized pets, damaging the property, etc. ), criminal activity, or failing to vacate after the lease term ends. Most lease violations will require the landlord to allow the tenant three days to cure the violation. However, if the violation is particularly severe, an option to cure may not be required. Our office provides these various notice forms at no cost. To download, please visit our forms page. If you have any question as to which notice is appropriate in a given situation, we strongly recommend you contact one of our attorneys at 801.571.6611.